Thin paths. Flat fields. No buildings, no machinery, no cover. The line of the river, yarning between thick green hems, two bridges, two crossings, the rain clipping our ears. We fix on the next step, and the next, puddles, ditches, stiles, lifting to a wooded embankment, a damp, porous corridor, the surface noise building up, cutting out, scratches and rips in the sound, minor roads to the north, a stepped slope ahead, the track recedes without us, falling out of the corridor, to a threshold, a shelter, an open-sided box on water. We’ve come to this wetland, two miles east of Mexborough, to record poems from The Navigators, Matthew Clegg’s new collection. The poems that Matt has chosen for this expedition are drawn from the ‘contemporary’ movement of the book’s title sequence, which traces the recovery of the South Yorkshire waterways after decades of post-industrial decline, and their rehabilitation as places of leisure. It’s interesting, then, to discover that the shallow lakes of Denaby Ings nature reserve were formed as a result of mining subsidence, and that the wooded embankment that gives access and protection to the reserve is the line of the former Dearne Valley Railway, which used to bear coal from the local mines. 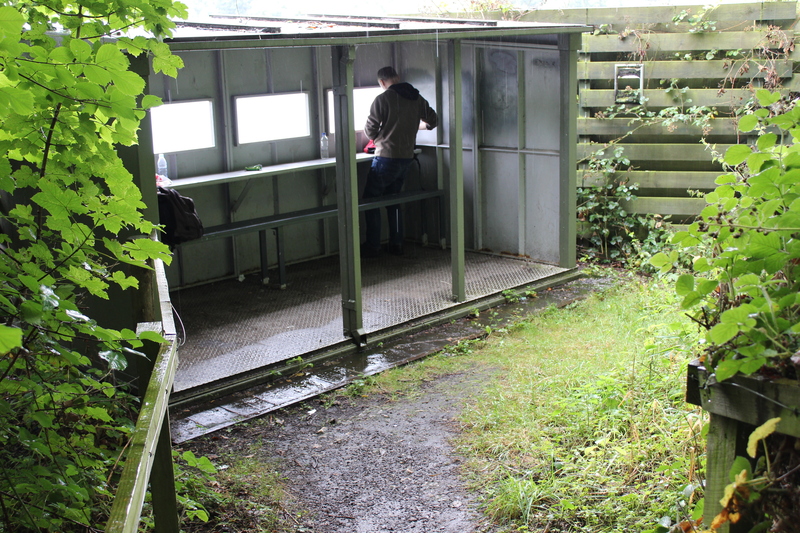 Denaby Halt was the first stop on the Edlington-Wakefield passenger service, until the station closed in 1949; the site of the halt is only a few metres from our shelter, a simple, three-sided viewing hide, the eyeline drawing level with open water. Uncoupled from networks and schedules, this is still a place of waiting, of watching, of transport. It’s also a place of listening. 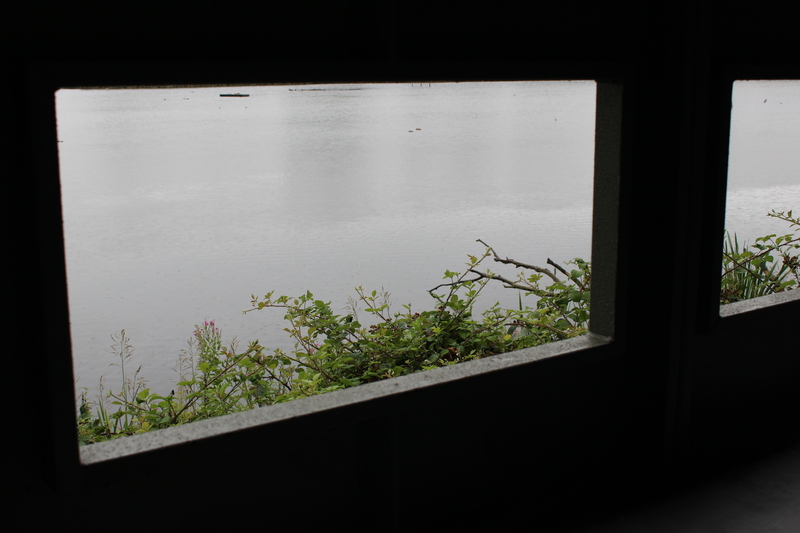 I’d anticipated a sound-bed of coots and terns, a lake-wide span on which Matt’s poems and commentaries might rest; perhaps some of the ‘honks’ and ‘trills’ caught by the narrator of ‘Brigand’, which takes this den as its setting, might also find their way into our recording. Today, however, the most prominent feature in the mix is rain, steadily building for the last hour or so, tracking our journey from house to hide, striking the roof above us. With no sign of it easing off, it’s clear that we’ll have to work with its rhythms, and maybe this is as it should be. Water is the element that moves through The Navigators, in all its fall and flow, linking the Cumbrian lakes to the rivers and canals of Yorkshire, sweeping on to the tide-pools and cave mouths of Flamborough and the open sea beyond. As we sit and listen to it beating on the metal frame of the hide, it takes on an industrial echo, a ghost of work. We’re only picking up a few discrete sounds from the environment that surrounds the shelter, which has the effect of making the space more intimate; oppressive, even. Without realising it, we’ve raised our voices, the downpour closing in; I reset the recording levels, taking them down, and down again, still peaking here and there. The rain has formed a second skin around the hide, audibly and visibly thick, a temporary curtain for the unwalled side of the structure, a blind at our backs. Most of the podcasts that I’ve produced with Matt have been recorded on the move. The three audio works that we developed in response to his first collection, West North East, were structured and focused by the act of moving from place to place, ranging from a short, intensive walk through North Sheffield to episodic and exploratory forays in East Leeds and Flamborough. As well as enacting a sense of journey, the process and the recordings (under the collective title ‘Fugue’) invited interruption and juxtaposition, a miscellany of unplanned, unexpected episodes that either tested the recording (heavy traffic, heavy weather) or helped to shape it (the crunch of snow under boots in late spring). Making a recording in an ostensibly static environment, as we are doing today, presents different challenges. Dynamism and movement can only be captured in a ‘fixed frame’; we can’t stray from this place, can’t move towards the source of any sounds that might tempt us out of our makeshift studio. Given the prevailing conditions, of course, we’re unlikely to be tempted. We try to recall if we’ve attempted anything along similar lines to this; we draw a blank, then remember a morning spent in a sea cave at Flamborough Head, some three years ago, recording the twelve-poem sequence ‘Cave Time and Sea Changes’ which closes The Navigators. We reflect on the contrasts and parallels between the cave and the hide. In one, a vertical rift in the rock, revealing sea and sky, is also the means by which the tide creeps in, breaching one threshold after another, raising the horizon and limiting our access. In the other, a view of calm, inland water is framed by four regular, rectangular gaps in metal, arranged horizontally; the water that moves is vertical, and holds us in the enclosure, rather than driving us out of it. Each space has its own distinct acoustic, too, the natural echo of the cave seemingly a world apart from the artificial compression of the hide. As Matt observes, however, the hide has conductivity; the rain’s rhythms are transmitted from without to within, the metal roof sharpening the pitch. We lean into the swell. The four poems Matt has chosen to read this afternoon are ‘Brigand’, ‘Mexborough, Water-Fronted Properties Released’, ‘ANGLERS REQUIRE PERMITS’ and ‘When They Next Make You Redundant’. We haven’t discussed the selection – the rationale, the relationship between poems and setting – which opens up a space for me to pursue threads and correspondences. In the glassy suspension of the hide, it seems that each poem enacts, or addresses, a surrender to drift. The narrator of ‘Brigand’, a member of the eponymous South Yorkshire motorcycle gang, seeks the trance-like detachment offered by the Denaby shelter, perhaps as a counterpoint to the noise and speed of the road. 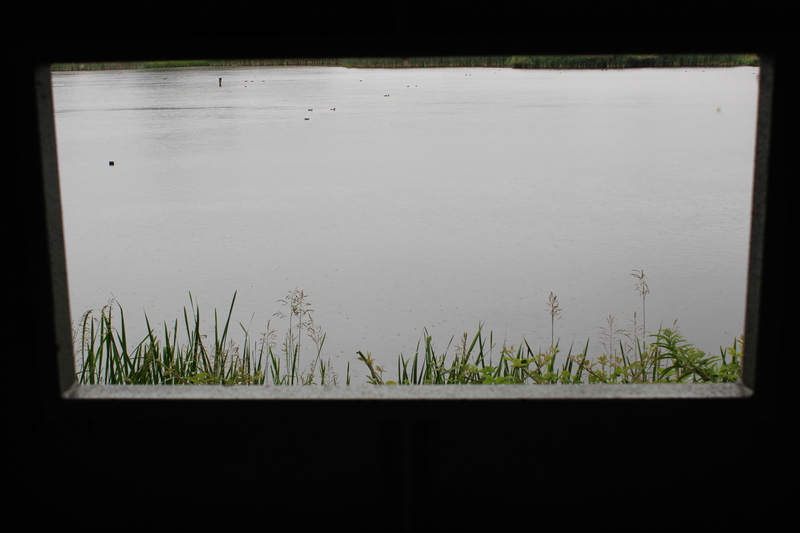 This is established in an act of attention – to the chafings and chants that rise from the Ings – sustained until the lake’s ‘lush trawl of sound’ subsides, and a bubble of quiet floats into the hut. The ‘drift’ in ‘Mexborough, Water-Fronted Properties Released’ spreads through sound, sense and form, as the marketed ‘properties’ of the poem’s found title (taken from a developer’s canalside hoarding, advertising new houses and apartments on the town’s eastern edge) are exchanged for the abstract properties of light, solidity and weight. The poem idles on the threshold of the concrete and the permeable, from which the rippled reflections of scaffolding are no more or less substantial than the ‘anchored / new-builds’. Organic and inorganic matter collects on the surface of the water; twigs and polystyrene converge, clot and scatter, the transitions preserved only by the passing eye. The spirit of haiku hovers over these lines, in their juxtaposition of images and contemplation of impermanence; Clegg takes this a step further, fragmenting the form, unmooring the words from orthodox lineation, setting them adrift in open space. We see the froth, the rippling wake, and it slows the pace of the poem. ‘ANGLERS REQUIRE PERMITS’ shifts the focus from water to land, and considers the unauthorised uses to which the land is put. It is unclear whether the ‘dumpsite’ of the poem occupies private or public space: the status of the site, the permissions that govern its use, and the materials accumulating there are in flux. We leave sofas and fridges ‘shedding form / and function’, becoming ash, becoming light. The fourth poem, ‘When They Next Make You Redundant’, hinges on the moment when the canal enters the river, drift yielding to current, gripping and directing ‘the steer of [the] barge’ as it moves through and beyond the last lock. 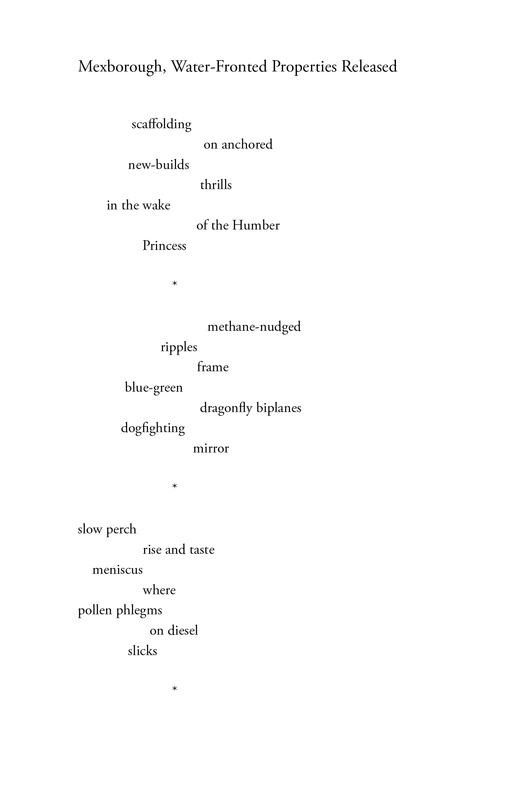 The poem is a double sonnet, literally hinged, the first line of the second sonnet mirroring the last line of the first, the remaining thirteen lines wrinkling and refracting their counterparts (‘where canal steps down to the Don’ / ‘and the Don sweeps on from canal‘). The ‘current’ gives the poem its flow, and its charge; the river’s circuit is the ‘mains’ into which the barge is ‘plugged’, and the source of ‘the trip in [the] blood’. This is one of the central themes of The Navigators, modulated and developed throughout the book: water as a conductor of energy, energy as a conductor of change. Denaby Ings, 18 August 2015. Photograph by Brian Lewis. The rain fastens on the hide. As Matt brings each poem to its close, we pause in the gap that it leaves. The weather is nudging us inward; our exchanges are hesitant, brief and brittle, the downpour pushes us back. It doesn’t feel right to be talking in here. It’s hard to think. The trance folds around us. In some respects, the metal shelter feels more remote than the Flamborough sea cave. The cave was a contingent space, a brief portal in which it wasn’t possible to settle; the knowledge that it would be breached by other visitors to the coast, and the returning tide, demanded that we work quickly. Since settling into the hide, we haven’t seen another soul, or felt the ‘outside’ world’s pressure, clamour or pull. Matt reaches for his copy of The Navigators, thumb skimming past the book’s central section, from which today’s selection has been made, coming to rest on a page in the first section. The poem he’s picked out is ‘The Tang’, a short, single-sentence lyric, written for another time, another place. In its summoning of ‘electrons / ferried / by rain’, however, it speaks to this time, this place. As Matt reminds himself in an extemporised introduction to the recording that we make a few minutes later, it also speaks of the desire to lose one’s cover, one’s protection; to step out of the frame and into the storm, to be charged by its current. This exposed, unscripted moment finds a place in the resulting podcast, sparking with urgency. It’s echoed in Matt’s closing remarks, in which he expresses a hope ‘that the language [of poetry] might be able to conduct an energy from the world’. We gather up our papers and equipment and step over the threshold, out of the frame, losing the hide’s rhythm, other sounds edging into earshot, the leaves, the track, the nick and tear of distant traffic.